Ten Commandments of Reusable Bag Use at the grocery store and elsewhere. How many reusable bags to you have in your car or home? Do you use them when you shop? Who would have thought that reusable bags, thought to be the solution to plastic bag pollution, would become a problem? Reusable bags were meant to supplant flimsy plastic grocery bags – the one-use, petroleum-based bags that critics say last for centuries and all too often wind up as litter or in the guts of sea life. It’s not clear the reusables have done that in any significant way. Indirect measures suggest that plastic bag production has remained relatively steady. What is clear is that reusables have taken off as a cultural phenomenon, social statement, and even art form. “People are accumulating too many of these, so we’re back to the original problem,” said Vince Cobb, a Chicago businessman who reinvented himself as a reusable-bag expert and salesman at www.reuseit.com. Not every reusable bag is environmentally equal. A nonwoven polypropylene bag, for example, would have to be used just 11 times to make up for the negative effects of a plastic bag used one time, according to a British Environment Agency study that compared bags. A cotton bag, however, would have to be used 131 times. Perhaps it was inevitable that a culture hooked on shopping would find itself obsessed with bags. But there is a problem. I have to admit that I did not realize the problems that reusable bag cause these hard working grocery professionals. Robin Shreeves the Stay-at-home mom blogger about finding eco-friendly food options came up with these Ten Commandments of Reusable Bag Use to help our friends at the grocery. Place your reusable bags at the front of your grocery order on the conveyer belt so the cashier knows you have them and want them to be used. Don’t freak when the cashier starts putting your groceries in plastic bags if you haven’t let her know you have reusable’s. 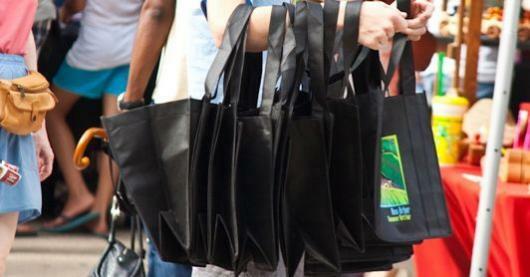 More companies are giving bags away as promotional items, if you already have enough, be polite and say No Thank You. This entry was posted in Sustainability, Waste Minimization and tagged Paper bag, Plastic bag, Reusable shopping bag, Shopping bag. Bookmark the permalink. 8 Responses to Ten Commandments of Reusable Bag Use at the grocery store and elsewhere. It would help if you explain why cotton bags have to be reused so many more times. In any case I have a set of cotton bags bought over 20 years ago and they’re still going strong. I daresay they’ve paid for themselves many times over. Greeting from DFK International Ltd.
We are proud to say that we are based in the “ GOLDEN FIBRE LAND “ of Bangladesh, where the raw jute availability is abundant resulting in the costings of jute and jute products very competitive. Raw Jute is a long, soft, shiny vegetable fibre that can be spun into coarse, strong threads. It is produced from plants in the genus Corchorus, family Tiliaceae. JUTE FIBRE is 100% bio-degradable and recyclable and thus environmentally friendly. It is one of the most versatile natural fibres that has been used in raw materials for packaging, textiles, non-textile, construction, and agricultural sectors. It helps to make the best quality industrial yarn, fabric, net, and sacks. JUTE products are gaining immense popularity around the globe due to the fiber’s properties, jute is a natural fibre with golden and silky shine and hence called The Golden Fibre. It is the cheapest vegetable fibre produced from the bast or skin of the plant’s stem and the second most important vegetable fibre after cotton, in terms of usage, global consumption, production, and availability. It has high tensile strength, low extensibility, and ensures better breath ability of fabrics, does not emit poisonous gasses when burnt and is inexpensive fibre. Moreover, advanced manufacturing techniques have also transformed jute into an attractive fibre with a high degree of user appeal. A dash of colors, a master’s hand at work, and you have the perfect fabric that can be transformed into almost anything. The in-depth knowledge of our products with a keen understanding of your needs and market is our great strength. We have factory sources who are capable to produce all your requirements and to your best satisfaction, so you can be rest assured whilst doing business from a distance. All our jute bags are manufactured using the best high grade fabric and also provide services of printing and embroidery on jute bags. We offer a wide range of jute bags in standard as well as in customized options. All these bags are offered in natural and various color options, and in different print and embroidery options. These are also provided with standard comfortable handles that makes them easy to carry on the shoulders. We are confident that we can offer better services, some of the reasons why you can select us against the others is – we have the expertise, cost factor, freight factor, availability of factories for orders execution, timely deliveries & requirements of documentations for ensuring easy imports. We do look forward to receive your valuable enquiry. Please don’t hesitate to contact us if you have any inquiry ,we assure you a prompt response at the earliest. Hooray for this great post! I have been wondering if, in our attempt to switch to an alternative to disposable plastic bags, we aren’t using more energy to produce these reusable bags than producing the disposable ones. I have to beg stores not to give me one now because I have so many in the back of my car. I’d love to do a calcuation of the amount of energy used to produce one reusable bag versus the number of plastic disposable bags that same amount of energy would produce. In other words, how many times do you have to use a reusable bag before you “break even” with disposable bags. Is it 10 times? 20? who knows? Personally I cannot believe any statistics that claim that plastic bags, made from petrochemicals, toxic to extract, toxic in manufacture, and toxic/offgassing in indoor air, and which never degrade, which end up all over the environment despite attempts to keep them from doing so because they are so easily airborne and misplaced, that are very often not recycled, because to recycle them one must bring them back to the grocery store, not merely put them in the bin at home, and that are only used as trashbags in very specific households (I do not have a dog, and do not use scooping cat littler, i could see using them for that, i use no liners in my small trashbins and empty all into my large bin with a full sized garbage bag in it) can ever, ever compare to paper bags, made from a natural, renewable material, yes clearcutting is bad but seen oil rigs and oil spills? come off it. clearcut land comes back a lot faster. and i recycle my paper bags 100% of the time, in fact they are an ideal liner to my paper recycling bin. as for reusable bags from china, i question whether they are really not lasting eighty times, and even if they did last eighty times if they are made from recycled plastic as many are or from natural fibers then i still believe they would be better. i find that most people who claim that reusable bags are bad, or that plastic bags are great, tend to be either ‘devil’s advocates’ or confrontational types who simply love stirring the pot in general, or who have ties to industry that finds plastic bags cheaper and easier to use or who makes a profit off them. given that many more people probably throw away, allow to escape (some) into the environment where it kills creatures and kills the beauty of the view for all who see it, or who keep ‘a billion’ (as a friend says) in their basement doing no good, and paper is much easier to recycle, i cannot believe any of the claims that are being made here. plastic sequesters carbron? huh? if we keep that oil in the ground and those chemicals from being made in order to be made into plastic, i think we will be much better off. as for the transit from china, well that is the way of the world now, these items are extremely lightweight and compact and i’m sure many zillions can be transported in a small amount of space, i cant see how that ever outweighs the hundreds and hundreds of wasted plastic bags and their associated impacts one reusable bag makes. no consumption is 100% green but we tend to want to live in the present and not like the hunter gatherers or the amish, so we will consume something. i always believe that reusable is better than disposable, and easily and frequently recycled is better than rarely recycled. btw the recycling of plastic is a nasty polluting process as well, and many plastics are shipped overseas for sorting and recycling! carbon! and where they go the environmental laws are more lax so they pollute even more during the recycling process. see van jones on this issue on Utube. i believe plastic is the number one worse item we use for packaging in any context and i avoid it as much as is possible. as for keeping your bags clean, sure yes, but who would ever need to wash them after each use? this seems like a very odd and bad suggestion. my bags rarely need to be washed. i am polite to the cashier and bagger, and i don’t freak out at them, but i am clear that if i dont have enough reusables I would like paper, and not paper wrapped in plastic, and that i would like the reusables and paper filled very full. i help bag myself, and i treat people like humans. i dont leave anything gross in my reusable bags. now, that was like three sentences. isnt that much easier than ‘ten comandments’? that’s really all it takes. Paper plate making machines, Wax coating machines. On my blog I have a “documents” menu item. If you click on that there are a number of papers that I have written that can be downloaded. We recently posted an article titled “Using Reusable Bags: It’s Not That Easy” to counter those who say using reusable is easy. Be sure to check out my blog at the above link.